To a regular reader of LTGTR it must be pretty clear that a bunch of vela people are the master minds behind every issue. So it just turned out that in one of our little casual chattering sessions Iyer suggested that we dedicate this issue to food, nothing really strange there, he totally digs food ( potatoes and cheese). Now the actual intent was really childish, food lovers attempting to show their love for the culinary wonder of good food. Reflecting back at that moment and pondering over the articles we have received from writers for this issue, it seems that we have actually picked up a topic of great social importance. Food is a basic necessity for survival (fornication, intimacy, friendship, philosophy and all that stuff seems really trivial on an empty stomach). Come to think of it we, the common populous of the hostels, never tire from complaining about the crappy food that is dished out to us every day. And in the process of our redundant chitter chatter we forget about the millions (if not billions) starving to death on the roads. The irony of the situation is amusing. We have progressed so far in the realm of science that the birth of the universe is slowly ceasing to be a mystery, yet we fail to alleviate the hunger of our fellow men. “GASTRONOMICAL DESIRES OF ASTRONOMICAL MAGNITUDES” and “Please sir, I want some more” take up these issues and to a large extent have done justice to it. Now leaving all the serious discussion behind we come down to the lighter side of the issue. We have tried to dish out some interesting trivia about food and restaurants here. We also feature an intriguing article about the transition of the US from a beer drinking to a wine drinking nation. Also along with the entire section on food, we have a few articles pertaining to fiction, music, Durga Pooja etc., all of which should be an interesting read along with a cup of hot coffee on a rainy day. plus we have a new column “One of India’s billion”, we might not have been able to do justice to the subject so bear with us. 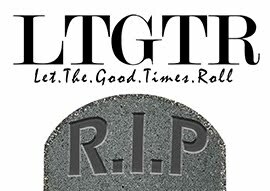 We sincerely hope you like this issue of LTGTR, and if you do please go ahead and join our Facebook page, also a few comments (criticisms) would help us a lot. Your appreciation and criticism will provide us the much needed support and motivation to continue with our work. A metal-head who's wants to do pursue a Ph.D Currently studying Biology & Comp Sc. at BITS,Pilani - Hyderabad Campus, his life-long ambition is to become a professor and wear shorts to work.